Quarterback Aaron Rodgers was selected in the first round of the 2005 NFL draft by the Green Bay Packers. Where will the players drafted by the NFL over the past few days do the bulk of their professional work? If trends in the past two decades continue, the answer is with the team that drafted them. For the piece I wrote last week on comparing consecutive years of the NFL draft, I downloaded year-by-year draft data from Pro-Football-Reference. The site includes, for each player in each year, his weighted career Approximate Value, a modified form of the site’s Approximate Value metric. It also includes the amount of the player’s weighted career value accrued for the team that drafted him. For each draft from 1970 to 2013, I summed the career value accrued for drafting teams by the first 222 players selected — 222, because that’s the lowest number of draft picks during the period, in 1994. Then I divided that by the overall career value of the year’s drafted players. 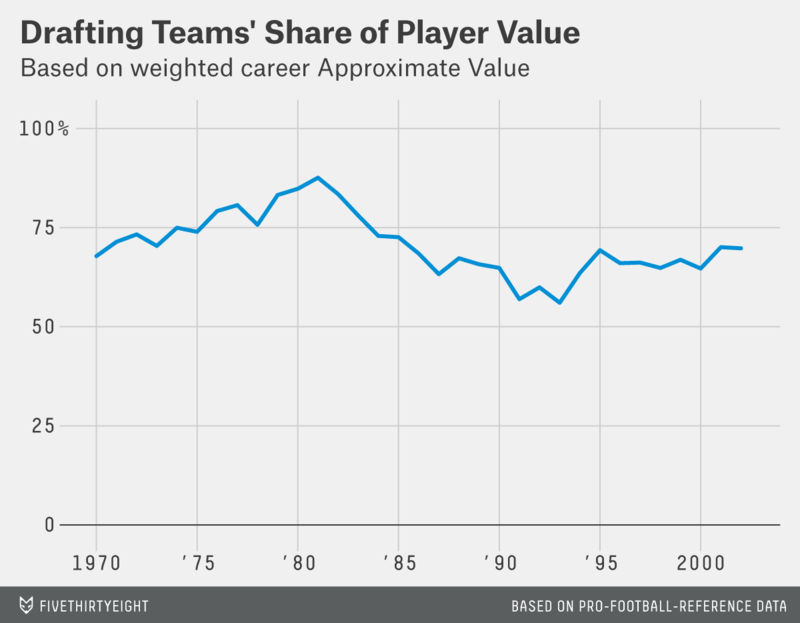 From the AFL-NFL merger in 1970 to 1981, drafting teams’ share of value kept climbing, to a high of 88 percent in 1981. Then the share started to fall, precipitously as the effects of free agency in 1993 started to kick in in players’ later years. Teams’ share of their drafted players’ career value was just 56 percent for those picked in the first offseason of free agency. But the reality has been different. Right after that nadir in 1993, teams’ share of their drafted players’ career value rose sharply, to 64 percent the next year and 69 percent in 1995. It remained in the high 60s nearly every year afterward. The results are similar when looking at all of a draft’s picks, not just its first 222. The downside to this approach is it can’t be updated all the way to the present. Drafted players are more likely to play for their drafting team in their first seasons in the league, before becoming eligible for free agency. So while teams’ share climbed to 86 percent in 2009 and 98 percent last year, those percentages are sure to fall. To approximate the trend in recent years, I isolated the analysis only to players who were no longer active last season. And among that group, teams kept getting a higher share of their drafted players’ value — above 70 percent every year until 2005, when retired players’ share of drafts’ value starts getting so low that the results aren’t meaningful. Here’s one piece of anecdotal evidence: Many of the most valuable players drafted since then remain with their drafting team, such as Aaron Rodgers, Frank Gore, Jahri Evans, Haloti Ngata, Patrick Willis and Adrian Peterson. What this all means is up for further analysis and debate. Maybe teams have gotten better at identifying their drafted talent before rookie contracts are up. Maybe they’ve come to value continuity in their rosters, for on-field benefits and for fan support. Perhaps players value continuity for the same reasons. Maybe the 2011 collective-bargaining agreement has changed things for some of the more-recent draft classes. Whatever the explanation, it’s clear that free agency has had a far bigger impact on players’ freedom to change teams than it has on the uniforms shown on trading cards.